Buy Cheap Daily Disposal Contact Lenses Online UK. The past decade has seen an astounding rise in the popularity of contact lenses. People across all ages and cultures are using them as a substitute for cumbersome glasses and even as a cosmetic tool to change the color of their eyes. Daily disposable lenses rule the roost in the contact lens industry. Like the name suggests, daily disposable lenses are ones which are worn for a whole day and then disposed off. They can not be re-used or worn for more than the stipulated time. These lenses have high oxygen permeability and possess a hydrating property. This makes them suitable for people with dry or irritable eyes. They are any busy-body’s delight because they require absolutely no cleaning and maintenance. Among all kinds of contact lenses, they are the safest because with them, chances of infection and protein deposits are extremely low and negligible. They are the best for people who wear lenses only on occasions- for parties or playing sports as they do not require storing for long periods of time thus reducing the probability of contamination. Being slightly expensive that their monthly, weekly and yearly counterparts; daily disposables offer a level of comfort and convenience that is difficult to replace. Most non-contact users are apprehensive about using lenses for the first time as due to prevailing misconceptions and lack of complete and correct information. Consult your eye-care practitioner for guidance who will help you select the best possible lens for your eyes. 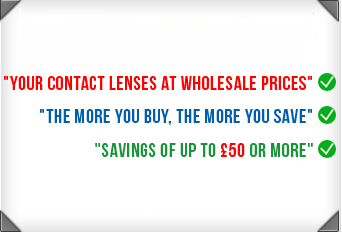 Most lenses are available over-the-counter, but you may also purchase them online Here. In case daily disposable lenses are not your cup of tea, you can choose from a variety of monthly disposable, bi-weekly disposable and yearly disposable lenses depending on your requirements and life-style. Contact Lenses Express provides and delivers a wide range products and brands and you are free to take your pick. Contact lenses express also offers a heavy discount of upto 70% on all their products like Daily Disposables, Monthly Disposables, Monthly Disposable Torics, Two Weekly Disposables, Extended Wear Lenses, Disposable Coloured Lenses, Freshlook Colourblends, Focus Visitint, Focus Dailies, 1 Day Acuvue lenses and Bausch & Lomb Soflens38. It is certainly hard to resist a deal like that! However, before ordering a pair of lenses, it is advisable to consult an optometrist for a correct prescription so that you don’t encounter problems after you make the purchase. Click Here to enter the details of your prescription. Most disposable lenses come in a “one-size-fits-all” size, but the ultimate fit largely depends on your eye’s individual contour and power. An optometrist will be able to assess the fit better and guide you on insertion and removal techniques so that you have a safe and comfortable lens wear experience. People with any kind of refractive error- myopia, hypermetropia, astigmatism and presbyopia can use daily disposable lenses. If a particular brand does not have your power in stock, you can always order a custom-made pair. Although these lenses ask for minimal care, basic hygiene of hands and nails is to be maintained before handling them.